The city of Gainesville is evolving, and its residents deserve a safe and efficient way to get to the heart of downtown, their workplace, the university, the medical district, and anywhere in between. We welcome this challenge by designing Florida’s first Green transit-oriented development: Celebration Pointe. Set to be completed in 2020, Celebration Pointe is a 225-acre mixed-use development with one million square feet of retail, office, and entertainment uses, anchored by Bass Pro Shops. Celebration Pointe will also be home to more than a 1,000 new residential units, creating a hub that blends a vibrant lifestyle with a comfortable and convenient living space. Environmental responsibility is at the core of this project, with 100 acres of environmental preservation space set aside. Celebration Pointe will be the first Green transit-oriented development in Florida and a certified LEED-ND (neighborhood development) site in keeping with national guidelines for community sustainability. Celebration Pointe is the 1st transit-oriented development (TOD) approved under Alachua County’s award-winning Mobility Plan. While the plan includes many innovative elements, translating those policies from concept to reality in the form of an actual development has been a challenge. Viking and the Celebration Pointe team have taken a collaborative approach working with county staff over the last four years to transform the vision into a successful, innovative venture. It is one of many reasons why Celebration Pointe has been able to obtain approvals in one of the toughest communities in Florida for new development. Alachua County is known to have the most stringent environmental protections in Florida and has historically been a slow growth community with some of the toughest land development regulations in the State. Celebration Pointe is the first large-scale project approved in the community since Haile Plantation was approved almost 25 years ago. We started with a vision and 225 acres at the northwest quadrant of Interstate 75 and Archer Road (SR 24). Ideally situated in the heart of Alachua County, Celebration Pointe has been designed to meet the retail and entertainment needs of the growing and affluent suburban neighborhoods on the West side of Interstate 75 and the growing demand for a walkable upscale urban housing environment. 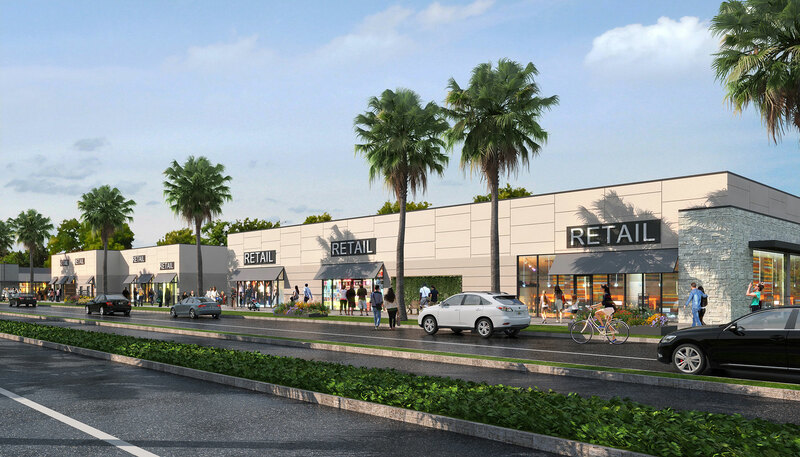 Celebration Pointe is the only large scale development in Alachua County featuring almost a mile of frontage along Interstate 75, providing great visibility for retailers and class A office tenants. With 700 acres of pristine conservation area along the western boundary of the development, Celebration Pointe blends an exciting urban environment with the beautiful natural setting that makes Alachua County and Gainesville such a desirable place to live. We want to create a place that is pleasant and easy to get to, walk through, and bike through. All streets in Celebration Pointe will feature wide tree-shaded sidewalks and inviting architectural elements. Major roads will also feature in-street bike lanes making it safe and easy to get around on two wheels. A multi-use path will run along the perimeter of the community and provide a safe, convenient and enjoyable place to take a stroll or exercise. The portion of the Archer Braid Trail being built by Celebration Pointe will provide connectivity to more than 40 miles of off-road trails that will provide a direct connection to the University of Florida and UF Health and to parks and schools near Haile Plantation. Celebration Pointe is working with the Regional Transit System and Alachua County to provide frequent transit service to the site that will connect Celebration Pointe with the University of Florida and UF Health, as well as other major destinations in the Community. In conjunction with Alachua County, we are also exploring the introduction of a trolley circulator and connecting with adjacent residential developments and future expansion parcels. Integral to the nature of this project is a four-lane bridge stretching across I-75, providing a crucial second major access channel to Celebration Pointe. Viking is working closely with Alachua County and the Florida Department of Transportation to design and construct this bridge, which will include the Archer Braid Trail, in-street bike lanes, and a dedicated lane for transit within the median and four travel lanes for motor vehicles. Not only will it facilitate entry and exit to Celebration Pointe, but will serve as a vital pedestrian, cyclist, and bus route across I-75, collectively saving hundreds of hours of commute time and increasing the safety and security of pedestrians. We wanted to bring a comfortable yet cosmopolitan atmosphere to Celebration Pointe. Working hand-in-glove with a focused team of highly acclaimed consultants allowed us to curate the Celebration Pointe experience with every consideration. We chose clean, industrial line work and precise geometry to reinforce a progressive flow of energy through the area. With that in place, we introduced warm earthy colors to create a welcoming, tactile atmosphere. infrastructure and natural environment, and positively change the quality of life for the community. At its completion, Celebration Pointe will generate over 2,900 permanent new jobs | The annual net fiscal benefit to Alachua County is projected to reach $1.8 million by 2020 and $2.5 million by 2030 | Celebration Pointe will generate more than $3.6 million a year in revenue for local governments. Celebration Pointe is a grand-scale project nearly ten years in the making. Its effects on Gainesville will be far-reaching and long-lasting. As Florida’s 1st Green Transit Oriented Development, Celebration Pointe is setting the standard for mixed-use developments by incorporating the latest innovations in community planning, transportation mobility, energy efficiency, green design and environmental stewardship. Designing an eco-friendly community that preserves the natural environment and reduces the city’s carbon footprint is absolutely integral to Viking’s mission to crafting healthy and sustainable community spaces. Established in 2006, it is the newest of the Haile Plantation neighborhoods. Haile Plantation Market Square abuts the Publix Market Square shopping center. The neighborhood has its own HOA, the Haile Plantation Market Square Owners Association. Residents of Haile Plantation Market Square enjoy easy walking access to a variety of shops, restaurants, and business services. The neighborhood is adjacent to Haile Plantation Tennis Center. Homes in the neighborhood include condos, townhomes, and single-family detached homes. Viking Companies © 2019. All Rights Reserved.